So, I've recently moved into a new house, which we're renting. And this house has a large kitchen, with a stonking great island in the middle of it. Therefore, no room to fit in a table. Our landlord had 3 high kitchen stools around it, and took these with him when he moved out, and so ever since, I've been looked for some replacements. Being a rented property, I wasn't wanting to spend a lot of money on these stools, if we're only going to get a couple of years use out of them. So I logged on to my old faithful ebay, to see what was going down. After a couple of weeks of near-misses on several items (kitchen stools seem to be in demand), I scored myself some little beauties - a great win, at £4.20 for three stools. £4.20! Good one, Trayns. So off I popped, 20 minutes down the road in the car, and picked them up. 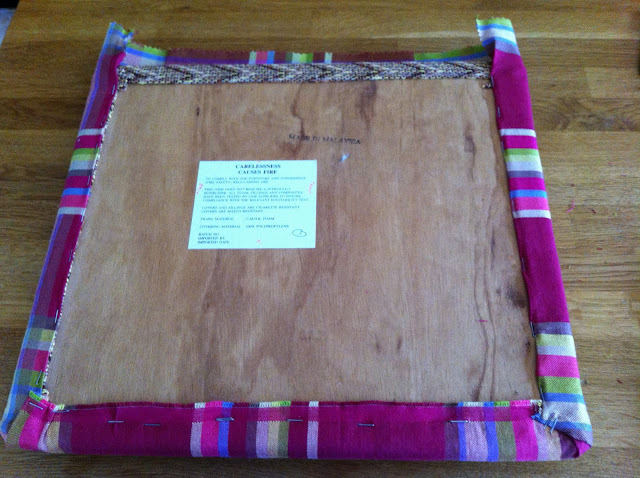 Back on ebay, I bagged myself two meters of bright pink check Liberty fabric to cover the stools with, for a fiver. And last weekend, I got my staple gun out and covered all three. You'll need hammer, to bang the staples in as far as they can go. Stretch the fabric over the seat pad as tightly as you can, being careful to keep the pattern straight, especially if it's got straight lines in it, like a stripe or a check. When you're doing the corners, snip out some of the excess fabric, so that you get a smoother finish. The stools are in decent condition, but the seats, which are upholstered, are covered in a very brown 70's looking fabric. Retro, and not in a good way. No matter, I have a staple gun and am not afraid to use it. I got back on ebay (love it) and found myself some fabric. Now, I am a great fan of buying fabric on ebay, which some people find odd, because you can't feel it, because a lot about buying fabric is how it feels. And it's also often difficult to get the exact idea of what a fabric will be like from just photos. However, I find that if you search by brand (Liberty, Designers Guild, Sanderson) you will always be guaranteed quality. Also, if it's a good listing, there will be detailed fabric composition info, and great quality, super-size photos, which allow you to see the texture of the fabric close-up. Some sellers also offer a free sample service. Carol Smilie eat your heart out.